Every year, A long list of the most innovative companies in the world is released by different organization like Forbes, Boston Consulting Group (BCG) etc. This year's most innovative list by Forbes and BCG has been released but the list is so contrasting. Can you imagine that BCG ranked Apple as the No. 1 most innovative company in the world which i think is quite okay while Forbes ranked Salesforce.com as the No. 1 most innovative company in the world. Why is this so different ? How did both of them come up with this totally contrasting list ? Boston Consulting Group (BCG) quizzed 1,500 senior executives and asked them which companies they thought were most innovative then they further examined the three-year total shareholder return, three-year revenue growth and three-year margin growth of each company to determine their position on the list while Forbes looked at the company’s income from existing businesses plus the anticipated growth from those businesses and also look at the net present value of those cash flows thereby deciding their spot on the list. On Forbes’ list, Apple ranks toward the bottom at No. 79 while they ranked No. 1 on Boston Consulting Group's list, BCG’s No. 2 and No. 3 companies are also tech companies: Samsung and Google. Samsung doesn’t even appear on the Forbes list, while Google comes in at No. 47. In reality, I think the BCG list is more accurate and acceptable than Forbes' because - you know Apple and you're aware of the new iPhone 5S & iPhone 5C Smartphones they just released and you hardly go a day without using Google, even if not Google Search maybe Gmail, YouTube, Android OS or just think of any Google product, but do you know Salesforce, Alexion pharmaceuticals or RedHat ? So slim !!! Well, lets take a look at the top 10 most innovative company from both Forbes and BCG. Note: Only Apple, Google and Amazon make Forbes’ list, coming in at 79, 47 and 7 respectively. 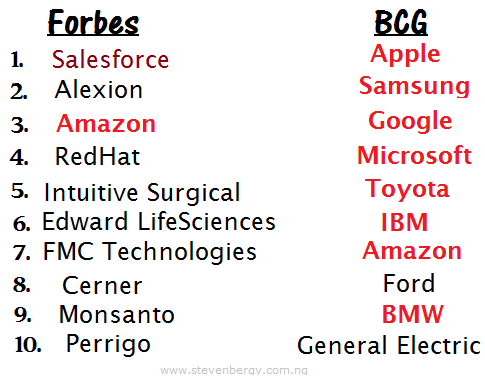 What do you think about the list of most innovative companies in the world (2013) from Forbes compared to BCG's ? Let's hear from you.